As a hygienist, I am asked daily what a patient can do about sensitive teeth. First, we need to understand the basics of what may cause tooth sensitivity. Recession is the most common cause I find here at the office. Recession can be described as an area near the gum line of a tooth where the gums have “pulled away” or receded from the tooth. This process exposes the root of the tooth, causing several nerve endings to be exposed. If you look closely, you can sometimes see a yellow or dark gray color where the root is exposed. As a result, brushing the area, eating sweets and drinking cold fluids can lead to sensitivity. It is often described as a “zingy” or “electrical shock” feeling. Teeth without recession present. The gums cover the entire root of the tooth. 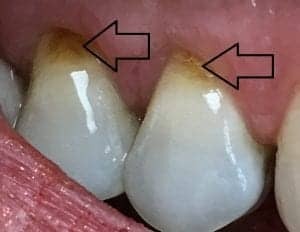 Tooth with recession present. You can see the slight difference in color where the root is exposed. 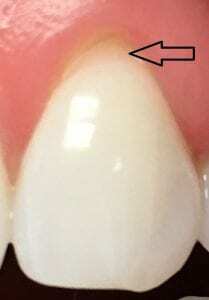 Another example of teeth with recession present. You can see the yellowish tint where the root is exposed. In home and in office teeth whitening systems can also cause short term sensitivity. 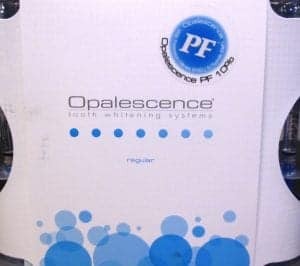 The reason for this sensation during and shortly after whitening is because the dentinal “tubules” or channels we have in our teeth are opened temporarily during the process. It is the movement of fluid within those tubules that are close to the pulp that causes sensitivity. A few days after whitening is completed, these tubules close up again and the sensitivity typically goes away. In both of these cases, sensitive tooth paste is typically your best first line of defense. Sensitive toothpastes have an ingredient called potassium nitrate that works to plug those nerve endings and block any sensations that you may feel. These sensitive pastes work best if you use them every morning and night. They are accumulative, meaning their effectiveness builds up over time. The longer you use it, the more effective it is. Using sensitive toothpaste in the morning and a different paste at night will not give you the same outcome. Whitening tooth pastes as well as tartar control pastes are not typically recommended for use with sensitivity. They both contain very abrasive particles that can scratch your root surfaces and add to the sensitivity. Extra soft bristled brushes and electric brushes are recommended when a patient has sensitivity due to recession. 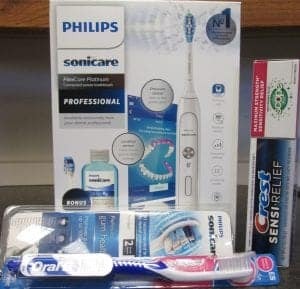 Oral B or Sonicare brushes have great technology that help prevent brushing too hard and causing more recession. There is also a great product that our office has tried with patients called Crest Sensi-Stop Strips. These work by placing a strip on the recession area for 10 minutes. It uses an ingredient called Oxalate that forms a barrier over recession areas. Many patients have found these to work well to relieve sensitivity. If sensitivity is severe due to recession, and the recession has increased since we’ve seen you last, a referral to a periodontist may be needed. In some instances they can perform a gingival graft to strengthen what gingiva is left and in some cases can increase your root coverage. As a last resort, a filling can be placed at the sensitive site. Typically, we avoid this if we can because any filling requires some of the tooth structure to be taken away before the filling can be placed. This can, however, help with sensitivity in those rare cases that other options are unable to help. Other forms of sensitivity can come from erosion of the teeth, tooth grinding, and broken teeth. These sensitivities should be brought to the attention of your hygienist and dentist, as they may need to be addresses with a more comprehensive exam and other types of treatment. Posted in Gum Health, Preventive Care, Uncategorized, WhiteningTagged my teeth hurt, rochester mn dentist, sensitive teeth, tooth sensitivity, what can I do about my sensitive teeth? A Smile A Day Keeps The Doctor Away! What is your reason to smile?